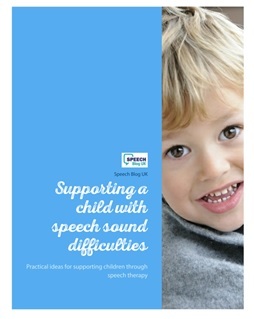 Many of the children I work with (especially those at junior and secondary age) have word-finding difficulties. It’s a term you often see written in speech therapy reports. But what exactly does this mean and how can you help? What is a word-finding difficulty? Basically, a word-finding difficulty is exactly what it sounds like – a difficulty with finding the words you want to say. This is something we all experience from time to time. The easiest way to explain it is that “tip of the tongue” feeling that you get when you can’t remember someone’s name or a word that you know you should know! It happens to us all more as we get older and particularly if we are tired or distracted. This explains why parents of young children often observe that they keep forgetting words! We all experience word-finding difficulties from time to time, but some people have this all the time. They know what they want to say, but can’t bring the words to the forefront of their mind. It can be really frustrating! How will I know that a child is struggling with word-finding? Word-finding difficulties can present in quite a few different ways. Here are some of the most common ones. Some children “ramble”. They talk around a topic, but don’t really get to the point because they can’t bring the right words to mind. Others start sentences, get a few words in, then stop and start again. Some will use a lot of non-specific words or filler words rather than specific vocabulary. For example, they might say “I saw that thing next to it”. A few will use made-up words or appear to mumble parts of their sentence. In any of these cases, it can be difficult for a child to get their message across. Give the child time to think and respond. This can be hard to do but it really helps. Try not to interrupt or tell them to hurry up. Wait and give them the time they need to finish what they are saying. Repeat new vocabulary lots of times. It really helps to make sure that the child learns new words thoroughly, as this means that they are more likely to remember them when they want to use them. 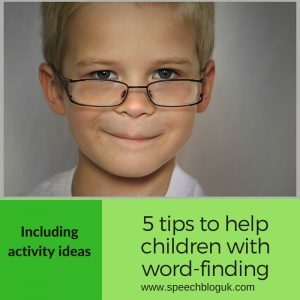 There are some ideas to work on vocabulary in this post and I highly recommend the Word Aware approach to really embed word learning into the curriculum for all children. Talk about all aspects of a word – it’s sound, it’s meaning, other words it is related to etc. Work on description skills. What do you do when you can’t remember a word? My guess is that you get round it by describing the word (e.g. “Today I met…er… I can’t remember his name… the guy who’s married to Sarah, has a beard….”). Someone supplies you with the name, and the conversation moves on. Sometimes you may even remember it yourself as you are describing. This is what we want to teach children to do too. Play lots of games to help with naming and describing skills to help develop their vocabulary knowledge and their ability to explain when they can’t think of a word. 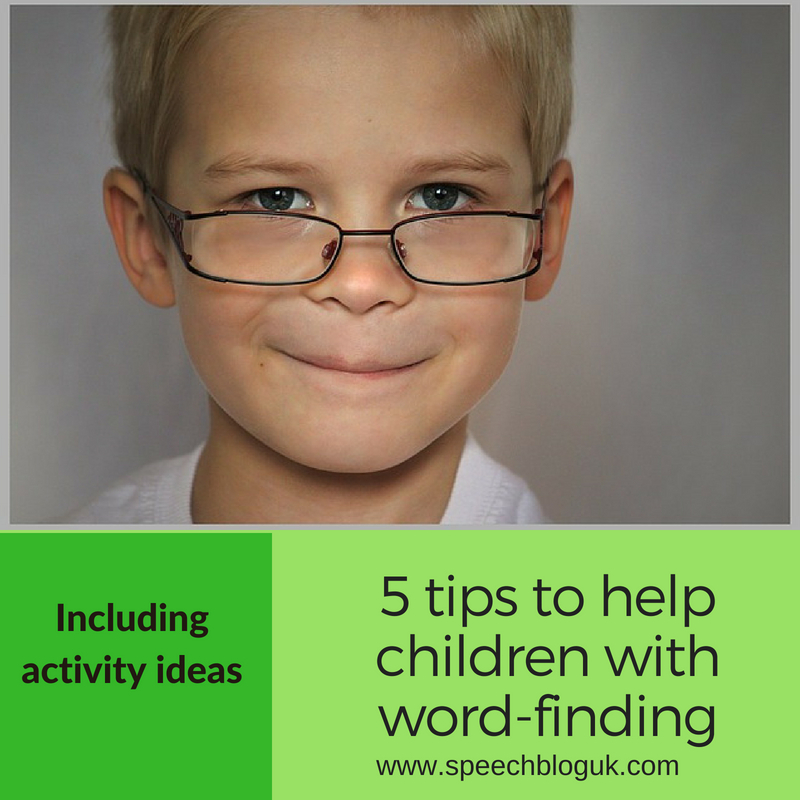 Here are a few ideas of activities to do with your child, which can help with word-finding. There are lots more too that we will share another day. Get a set of picture cards of objects or animals. Take turns to take a picture and describe it for the other person to guess what it is. Talk about what makes a good clue. e.g. “it’s black” is not necessarily a helpful clue for a cat, but “it says miaow” might help you guess it more quickly! Think of a category, such as farm animals, or clothes. Roll a dice and see if the child can think of that many things which fit the category. For older children, make the categories harder (e.g. things which are red, or things that are round). You can also do this the other way round. List a few items and see if your child can work out the category. e.g. carrots, potatoes and peas are all…. Talk about similarities and differences between different things. You could find two different things around the house and see if you can think together of what is the same about them and what is different. For example, a glove and a sock are both clothes, they both come in pairs, they are both soft. However, a glove goes on your hand and a sock goes on your foot. What do you find helps your child or the child you work with? 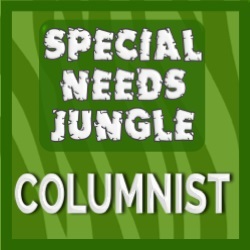 Do add your ideas and experiences here too to help us all! Many of the pupils I work with use sign language to cue themselves to ‘find’ the spoken word; they will sign the word & that prompts them on the spoken word. Helen, this is an awesome post especially for parents. I love how simply you have phrased the strategies and I love the ideas for activities. Thank you so much!